New Training Opportunities – Rosewood Services Founder and CEO Tammy Hammond cuts the ribbon to celebrate the opening of the Rosewood Maintenance Training Facility in downtown Great Bend. Standing right of Hammond is Vicki Schmitt, Senior Director of Services, and left is Amanda Hammond, Director of Services. They were joined by nearly 20 staff and clients who are involved with the new training facility. 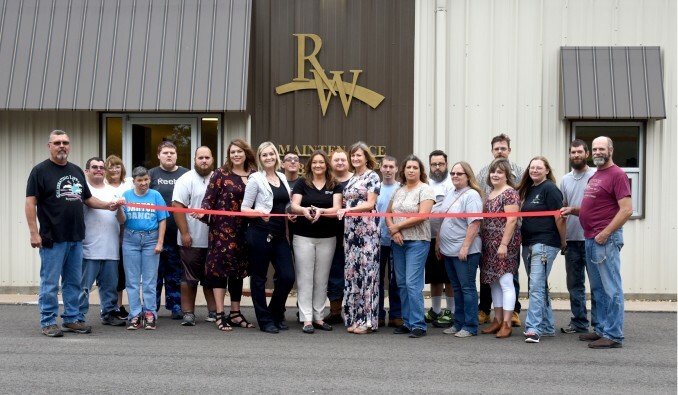 In an effort to diversify employment training opportunities for people with developmental disabilities, Rosewood Services has opened its Maintenance Training Facility at 2200 Main Street, Great Bend. The new facility is designed to train clients in the areas of mechanical repair, vehicle detailing, window washing, lawn care and electronic recycling. With mechanical repair, clients learn how to repair small items such as lawn mowers, bicycles, and furniture pieces. Vehicle detailing teaches them how to detail the interior and exterior of vehicles, which includes detailing wheels, washing, waxing and polishing vehicles, plus learning aspects of running a car detailing business. The new window washing program trains people how to professionally clean windows. Lawn care teaches them how to water and maintain lawns. And an electronic recycling program is being introduced that teaches clients how to safely disassemble old electronics, such as computers, televisions and radios and prepare them for proper recycling. For more information, contact Anna Hammond, Rosewood Services, 620-793-5888.